After you selected a pencil line texture, if you wish to resume drawing solid pencil lines again, you can do so using either the Colour view or the Pencil Properties dialog. Click on the Show Pencil Texture Palettes button to display your pencil texture palettes. Over the swatch list, click on the No Texture button. From now on, the pencil lines you draw will not have a texture. In the Colour view, select the colour with which you wish to draw. In the Tool Properties view, click on the arrow button next to the stroke preview area to open the Pencil Properties dialog. In the Pencil Properties dialog, click on the Texture tab. 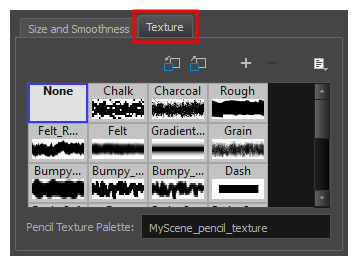 In the pencil textures library, select None.